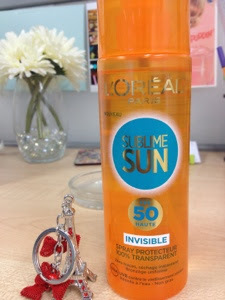 She got me this cute key chain and an invisible sun protection spray from L'oreal. 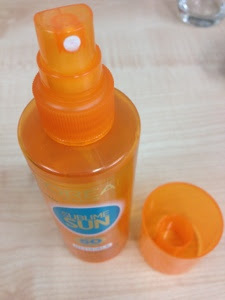 I was so excited when I received this sunscreen spray. 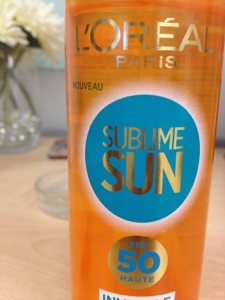 I am just into apply sunscreen before I leave the house and it has in turn become a routine in my life (which changed from before). 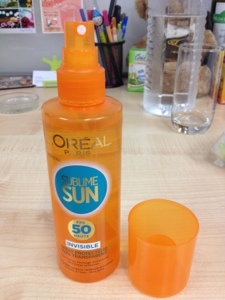 It has SPF 50 and it's an invisible spray. 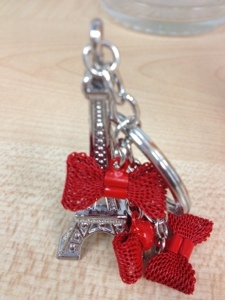 All the wordings behind were in French, so I couldn't make what formula it was. I did try to search on google.com but there was not much about this spray at all. But from what I assume, you should be able to spray in on top your make up. So that is why I have on my work table, so that I can re- apply my sunblock in the afternoon. There is no white cast from this spray. It has a strong sunscreen smell but I am ok with it.